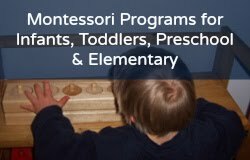 What is Montessori's view on a crying baby? Let it cry or give it immediate attention? I have this three-month-old [in my daycare] who cries when he is not picked up.... His mother said that she lets him cry until he goes to sleep, she does not pick him up, as long as he is fed and dry. What is the Montessori view on this matter?